Congratulations Daniel this is a beautiful image. Thank you for participating in my Transportation Photo Challenge. Stunning shot. I love the simplicity of the shot, but yet it has so much emotion behind it. The steam adds a very nice element to this photograph. Nice work! Love the athmosphere.. Great job! Damn... What a beautiful shot! Captured two of my favorite things to do perfectly. you know, when i saw this in voting for the kayak comp, i thought this might be the winner.. Shame.. I think this is an awesome shot.. I had gotten on the lake by 5:00 am and this was taken shortly after getting on the water. We were out to shoot loons but the fog was so thick before sunrise and could still be seen rolling down the hills until about noon. This was taken hand held with a Nikon D3s camera and a Nikon 200-400 mm lens. While looking for loons in the early morning fog, I soon realized finding any loons would be difficult with the thick fog limiting visibility. 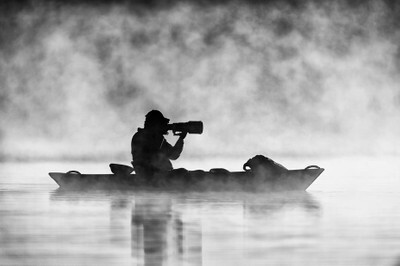 The only subject of note was my friend and fellow photographer in his kayak; particularly when the sun came up providing the backlighting. I shoot in RAW and do basis processing which typically includes, noise reduction, sharpening, exposure, colour balance (converted to black and white in this case). I also crop to taste. I like options and carry lots of gear on any given day. I generally have a full frame camera and a crop sensor camera as well as lenses providing focal length options ranging from 14 mm to 600 mm as well as teleconverters (1.4; 1.7; 2.00). All cameras and lenses are Nikon. I generally use a 3 or 5 series Gitzo tripod with Jobu or Wimberley Gimbal head. This type of shot requires heavy fog which means shooting in early morning light. Having an interesting subject to silhouette also helps.